Content by Tony Macklin. Originally published on January 6, 2018 @ tonymacklin.net. Love isn't having to say you're sorry anymore. In 2018, love is having to cook mushrooms. At least that's the moral of Phantom Thread. The film is an idiosyncratic, perhaps indigestible love story. Reynolds Woodcock (Daniel Day-Lewis) is a haughty egotist. He is a dress designer for the elite. He is obsessed and constantly vaunts his absolute authority. His sister Cyril (Leslie Manville) is the protector of his unassailable values. But in the London of the 1950s he is facing a changing time and a future where standards are in flux. Into his life comes a young waitress Alma (Vicky Krieps), who becomes a model and then his love interest. Their relationship evolves mysteriously. One wonders who the audience is for Phantom Thread. It demands a tolerant audience. Writer/director Paul Thomas Anderson is an unpredictable auteur, whose vision is a bit myopic. His screenplay for Phantom Thread is sporadic and thready. It's hard to care much about Woodcock and Alma's relationship. Directors today seem to believe close-ups carry irresistible emphasis, but they're still a device. Details - no matter how close - do not make plot. Daniel Day-Lewis gives his usual committed performance. It supposedly is his final one on screen. It is solid and able, but uninspired. But repression isn't an inspiring quality. His relationship with Vicky Krieps's Alma has harmony, but it is somewhat tepid. 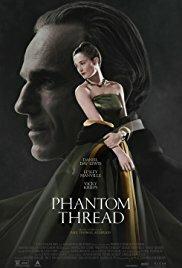 Phantom Thread is two gifted filmmakers - Anderson and Day-Lewis - limited by a pattern that enfolds them. Both endure. Phantom Thread is a war between glamour and tedium. Which wins is up to you.